Kombucha has been in the news recently because it has been pulled from the shelves due to an alcoholic content in excess of the .5% ABV cap on "non-alcoholic" beverages. If you haven't heard of it, kombucha is a sweetened tea that is fermented with a mix of yeast (including Brettanomyces) and acid acetic producing bacteria. I thought it might be interesting to try a couple of commercial beers that are blended with kombucha for sourness and complexity. Some long time readers of the blog might remember my experiments with kombucha (including a Flanders Red Kombucha) about three years back. I couldn't keep up with the cycle of production that keeping a kombucha culture demands (partially because my results weren't that great) so I eventually passed my scoby ("mushroom") off to my friend Nathan (who promptly threw it out). The first beer is Lambrucha, a 3.5% ABV blend of year plus old lambic and kombucha from Vanberg & DeWulf (importers of such tasty beers as Saison Dupont, and Witkap Pater). The result is more like carbonated lemonade than anything else. Bright, citrusy, fresh, with vibrant carbon dioxide rising through the off-pink body, but not much head. The low alcohol and citrusy tartness make it a wonderfully quenching/refreshing beer, but with 1 year old lambic as the main ingredient I would have hoped for more complexity and Brett character. 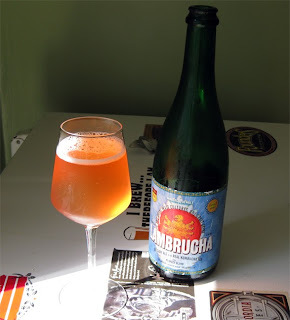 I would have been interesting to taste the lambic before and after blending to taste exactly what the kombucha contributed (I suspect that brightness that is rare in straight lambics). 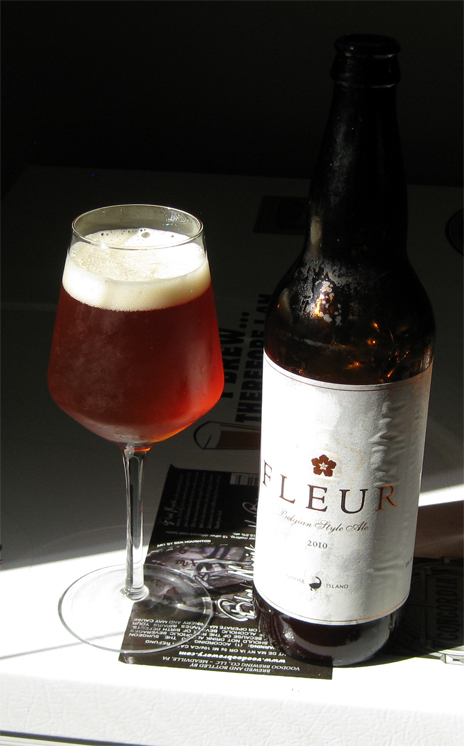 Goose Island's Fleur looks and smells much more like a beer than Lambrucha (it is twice the alcohol so that isn't too surprising). It pours a hazy light amberish-red with a small white head. The aroma is very fruit, with strawberry and banana (and a light "artificial" bubblegum smell, maybe the hibiscus?). The flavor is similar, but it adds a bit of spice and a faint tartness (even some malt...). Fleur doesn't make the kombucha suggestion as strongly, relying on the fermented tea for complexity rather than as a main selling point (the bottle makes no mention of kombucha). While it is a more complex beerier beer, it lacks the brightness and drinkability of the Lambrucha. Two interesting beers that use kombucha in different ways. I think as time goes on we will see more and more breweries blending kombucha into beers as a cheap/quick way to add some balancing acidity. Blendiung non-beer beverages into beer seems to be getting more popular in general. Lost Abbey for example has been doing blending beers with mead and wine as components. These are ll options for blending at home, and are all things that you can either make at home, or just buy for convenience and variety (as many people do for simple "bourbon barrel" beers). I've been interested in experimenting more with kombucha/beer ever since AlB included it in his last Bugfarm slurry! A friend gave me some of his but as you said, keeping up with it is tough unless you're drinking it daily! After getting good results from Bugfarm III, I was tempted to include some in the barrel I emailed you about, but I think I'll experiment on a small scale first. It seems like something that could get out of control easily, especially with the acedic acid thing going on. . . I've had a few bottles of Fleur from goose island. I drink kombucha semi regularly so I had to try one...then I had two. The first bottle seemed more bright and the second seemed more dank and funky. While I was not outrightly impressed, I am intrigued and set a couple aside to see if they develop some additional complexity after a few years in the bottle. Also, I did not know there was another beer doing something similar. The dregs of the first Fleur ended up in one of my sours. Most commercial craft beer sold in America is unpasteurized. I can’t speak definitively on either of these kombucha beers, but there was certainly some yeast sediment in Lambrucha. Personally I drink beer/kombucha for the flavor, not for any health benefits which they may or may not provide (but if it encourages you to make your own more power to you). You can get a starter culture on ebay for like $6. It's so CHEAP to make (the price of 2 cups of sugar 10 tea bags!) and a hell of a lot healthier than anything that you can buy at a liquor store. I strongly recommend EVERYONE try it out. If you do it RIGHT (make sure everything is CLEAN and follow SIMPLE instructions) then you can not mess it up. And trust me on this, home brewed is an entire universe away from that trash in a bottle. It's like comparing instant coffee from the dollar store to fine, freshly ground Colombian roast. I am wondering what would happen if you added the Kombucha Scoby to the primary fermentor at the same time as the brewing yeast? Or would the yeast and the Kombucha fight each other ? I am really interested in making sour beers (with at elast 5% ABV). It might be better to make a blend like the commercial brewers did, that way the high gravity wort would not kill the Kombucha. If you have any tried and tested methods (I read your previous article back in 2007 regarding the Flanders Red )I would love to hear them. The kombucha needs oxygen, so all the CO2 produced by the yeast in primary fermentation would probably reduce its activity. It could certainly be worth a try, but it wouldn’t be my first choice for brewing a sour beer (I don’t like acetic acid and with all that alcohol it could get vinegary quickly if given access to the air). Good luck, happy to answer any questions you run into.